Yuri Asks: What is Ghost Fishing? For generations fishing has been a pivotal activity for both survival and recreation. Over time a variety of tools and technologies have been introduced into the fishing industry in order to make catching more efficient and productive. What is “ghost fishing?”: Lost or abandoned fishing gear like cage traps, gillnets, and trammel-nets that are still functional and result in marine mortality (Matsuoka et al., 2005). Much of the fishing gear that is lost can be attributed to entanglement of gear, unintentional or intentional dropping of gear, working in deep water, and interactions with other fishing gear (Matsuoka et al., 2005; Brown & Macfadyen, 2007). The lost and abandoned fishing nets tangle on different structures like artificial reefs, wrecked ships, and rocks thus trapping and killing different organisms. The dead organisms serve as bait and lure in more organisms, like fish, and increase the number of ghost fishing incidents (Matsuoka et al., 2005). 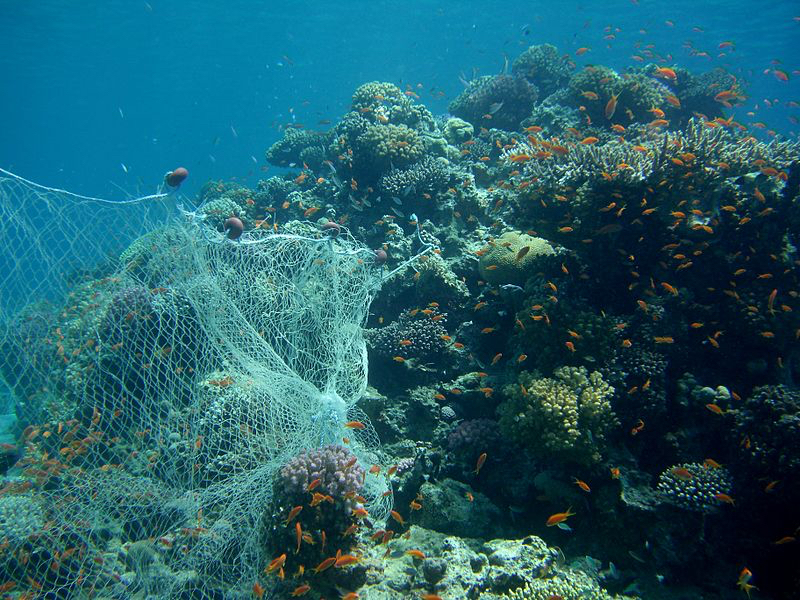 In addition to fishing nets, cage traps can capture organisms and create a similar event of a dead organisms aggregation, luring and trapping more marine life. According to a 2007 cost-benefit analysis done by Brown and Macfadyen, in one year they found that ghost catches represented 5% of the total active catches per vessel (Brown & Macfadyen, 2007). Similarly, in a study done calculating the number and cost of Dungeness crabs lost to derelict fishing gear found that 4368 crabs were entangled, a loss that was equivalent to $19,656 worth of crab (Gilardi et al., 2009). This study only monitored the loss incurred from one commercial fishery indicating that the loss from multiple fisheries would be much greater. The economic loss from derelict fishing gear could be avoided by allocating funds for net removal (Bilkovic et al., 2014). In an additional study done by Bilkovich and colleagues, observing the removal of derelict fishing gear from the waters of Virginia they found that over the course of four years 31,546 marine organisms and 40 species were captured in derelict fishing gear (Bilkovic et al., 2014). The issue with lost nets and traps are that many of them are not biodegradable and can survive for many years. In shallow waters cage traps can continue trapping for approximately three years. In cold waters fishing gear is expected to have a longer life due to preservation in lower temperatures and less wave action (Matsuoka et al., 2005). The longevity of fishing gear makes remediation efforts very important for both the present and future of marine life. In order to remediate and combat the increasing incidences of lost or abandoned fishing gear, several solutions have been illustrated to alleviate the increase in marine mortality. In general, remediation efforts are geared towards net modification and early education. Many of the net modifications solutions include the incorporation of biodegradable nets made out materials like twine of cotton, gear marking systems to identify, and tracking technology to locate the position of gear (Matsuoka et al., 2005). In addition to alterations to fishing technology, early education and the promotion of moral and social welfare can be a useful tool to help individuals understand the role of prevent and the effects of lost or abandoned tools and ghost fishing (Al-Masoori et. al., 2004). In order to generate change in both the commercial and recreational fishing industries, worldwide policy and regulation are necessary to curb the loss or abandonment of fishing gear. Often the most difficult aspect of tackling the issue of ghost fishing is the necessity for global compliance. There are many countries, communities, and individuals that rely on fishing and require fishing gear, thus making it difficult to make worldwide regulations that will maintain the safety of marine life while supporting the livelihood of the world. Furthermore, policy implementation is a slow and taxing process because it is often difficult to gain unanimity across differing countries with differing socio-economic statuses. Yuri Walsh is a student at UC Davis, majoring in Environmental Science and Management and is pursuing a minor in ARC GIS (a geographic information system). She is a fourth year and is considering a career in Environmental conservation, education, and consultation. Donna Marie Bilkovic, Kirk Havens, David Stanhope, Kory Angstadt (2014), Derelict fishing gear in Chesapeake Bay, Virginia: Spatial patterns and implications for marine fauna, Marine Pollution Bulletin. Volume 80, Issues 1–2, pp. 114-123, https://doi.org/10.1016/j.marpolbul.2014.01.034. H. Al-Masroori, H. Al-Oufi, J.L. McIlwain, E. McLean (2004), Catches of lost fish traps (ghost fishing) from fishing grounds near Muscat, Sultanate of Oman, Fisheries Research, Volume 69, Issue 3, pp. 407-414, https://doi.org/10.1016/j.fishres.2004.05.014. James Brown, Graeme Macfadyen (2007), Ghost fishing in European waters: Impacts and management responses, Marine Policy, Volume 31, Issue 4, pp. 488-504, https://doi.org/10.1016/j.marpol.2006.10.007. V K Gilardi, Kirsten & Carlson-Bremer, Daphne & A June, Jeffrey & Antonelis, Kyle & Broadhurst, Ginny & Cowan, Tom. (2010). Marine species mortality in derelict fishing nets in Puget Sound, WA and the cost/benefits of derelict net removal. Marine pollution bulletin. 60. 376-82. 10.1016/j.marpolbul.2009.10.016.